Colour Forecast lipsticks in Bubblegum and Victorian, Colour Forecast Tinted Lipglass in Electric Fuchsia, & Viva Glam Gaga lipsick. So what do I think of the collection? Honestly, I was more excited than I should've been. I know that lots of people are loving this collection but I'm more on the "like it, but don't need it" side. 1. Bubblegum Lipstick ($14, Glaze finish)- Medium pink with a slight lilac/purple undertone and it has a good amount of gold shimmer. It's also incredibly sheer. I knew it was a glaze but I assumed that it would be buildable -which it wasn't (at least on my lips.) I was disappointed because I had hoped for this to be like Lavender Whip or Fashion Mews -more purpley colors. 2. Victorian Lipstick ($14, Frost finish)- Llight-medium cool toned pink with hints of salmon with a golden sheen. 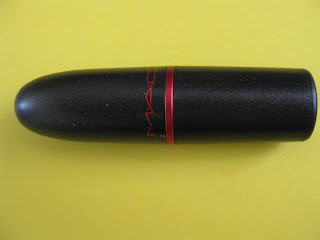 It's one of the "not too frosty" MAC frost lipsticks. 3. Electric Fuchsia Tinted Lipglass ($14)- Bright fuchsia with a hint of violet and contains blue shimmer. Very pigmented color and almost like Funtabulous Dazzlegloss but it gives better color payoff. 4. Viva Glam Gaga Lipsick ($14, Lustre finish)- The color of the lipstick is a cool toned pale blue pink. 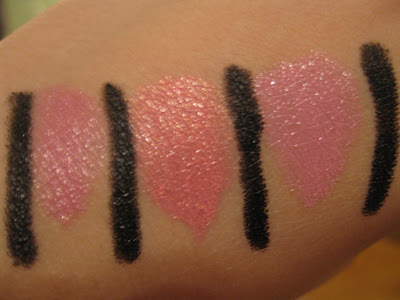 Because it's a lustre, it is slightly sheer but the color is buildable -it even goes on slightly opaque! Love that it's not drying on my lips. The tube is black but there is a red ring around the tube, sort of resembling a "bullet." When you pull of the lid, the top half of the tube is red and Lady Gaga's autograph is written in black. 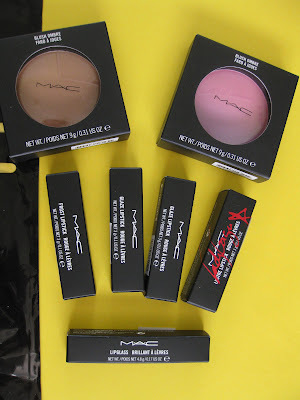 100% of the proceeds goes to the MAC Aids Fund. 5. 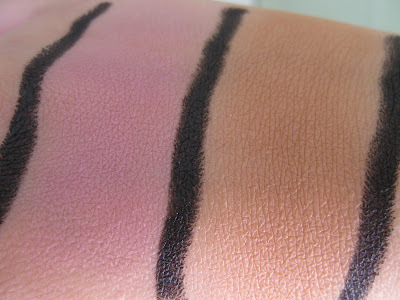 Blush Ombre in Azalea Blossom ($25)- Light, cool tonerd blush with hints of lilac and slight shimmer. Love the pink and purple combo. 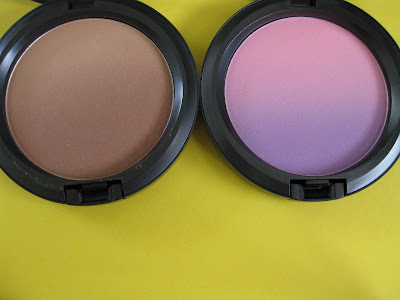 This is a cooler blush so I thought it wouldn't work on my warm skin but it does! I just have to apply it with a light hand. 6. Blush Ombre in Springshine ($25)- Pretty neutral color -just a medium bronzey brown with shimmer. I can see myself using this for just a touch of color, bronzing, or even contouring. 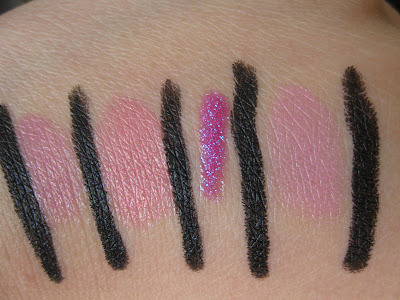 To the right are lipstick swatches of (from left) Fashion Mews, Bubblegum, Lavender Whip, & Up the Amp. 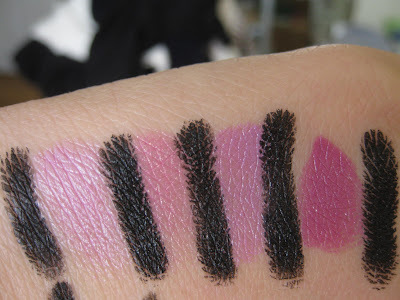 I wanted to show you the swatches of them all side by side since Bubblegum reminded me of Lavender Whip and Fashion Mews. Now when I look at it, Bubblegum is a lot more on the "pink side" and is not very purpley -it has more of a slight lilac undertone to it. Have you picked up anything from Colour Forecast? 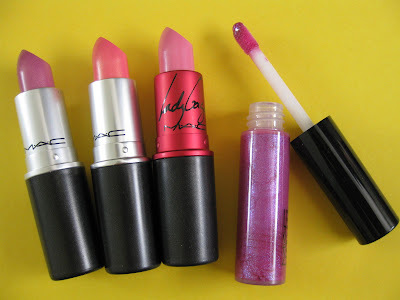 What about Cyndi or Gaga lipstick? P.S. Both Cyndi and Gaga Viva Glam lipsticks will be available for 12 months.